Egypt. 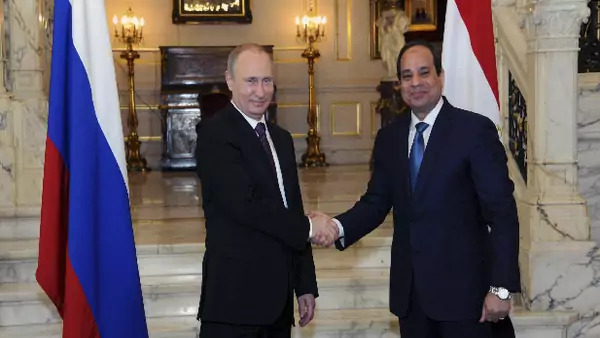 Russian President Vladimir Putin and Egyptian President Abdel Fattah al-Sisi announced an agreement to jointly build Egypt’s first nuclear power plant on Tuesday during Putin’s first visit to Egypt in over ten years. State Department spokesperson Jen Psaki stated that, “[the United States] support[s] peaceful nuclear power programs as long as obligations under the Nuclear Nonproliferation Treaty, to which Egypt is a signatory… are fully met.” Meanwhile, an Egyptian court ordered the release of the two remaining Al Jazeera journalists in custody today. The announcement followed the publication this week of a previously undisclosed opinion by Egypt’s highest appeals court criticizing the journalists’ earlier conviction as baseless. Egyptian-born Canadian journalist Mohamed Fahmy was ordered to pay the equivalent of $33,000 as a condition for being released on bail, while Baher Mohamed, an Egyptian national, was released on bail on his own recognizance. ISIS. The White House confirmed on Tuesday the death of Kayla Mueller, an American aid worker who had been held hostage by ISIS. A spokesman for ISIS claimed that Jordanian airstrikes in Syria last week were responsible for her death, though officials in Washington and Amman said the cause of death was unclear. Jordan continued to ramp up its airstrikes against ISIS in retaliation for the killing of its pilot, Moaz al-Kasasbeh, last week. Meanwhile, the United Arab Emirates launched its first airstrikes against ISIS targets in Syria since December after being notified by United States Central Command officials that additional rescue helicopters had been deployed to Erbil, Iraq, to be closer to the zone of combat. Tunisia. Tunisian authorities on Monday arrested over thirty extremists who were allegedly planning attacks on civilian and military sites in Tunisia. According to Mohammad Ali Aroui, spokesperson for the Interior Ministry, the militants planned to target the Interior Ministry and two National Guard posts. He added that many of those arrested had travelled to Syria to fight. Libya. UN peace talks resumed yesterday in Ghadames near the Algerian border, led by UN Special Envoy Bernardino Leon. UN officials said yesterday’s talks aimed to secure a deal on a unified government, a ceasefire, and on removing armed militias from Libya’s main cities. Meanwhile, Libyan special forces announced Monday that they had retaken Benghazi’s main military base from Islamist fighters. The special forces are backed by troops led by Heneral Khalifa Haftar, who supports the internationally recognized parliament, led by exiled Prime Minister Abdullah al-Thinni. Bahrain. Bahrain’s Information Affairs Authority (IAA) announced on Monday that it decided to suspend the activities of a new Saudi news channel, Alarab, hours after it went on the air on February 1. The IAA cited “technical and administrative reasons” for the suspension, but it also accused Alarab of failing to “take account of efforts aimed at stemming the tide of extremism and terrorism throughout the region and the world.”Alarab had interviewed Khalil Marzook, the deputy leader of the Shia opposition party al-Wefaq, which is openly critical of the Bahraini regime before its activities were suspended.